Chambéry ([ʃɑ̃.be.ʁi]; Arpitan: Chambèri, Italian: Sciamberì) is a city in the department of Savoie, located in the Auvergne-Rhône-Alpes region in south-eastern France. It is the capital of the department and has been the historical capital of the Savoy region since the 13th century, when Amadeus V, Count of Savoy, made the city his seat of power. Together with other Alpine towns Chambéry engages in the Alpine Town of the Year Association for the implementation of the Alpine Convention to achieve sustainable development in the Alpine Arc. Chambéry was awarded Alpine Town of the Year 2006. Chambéry was founded at a crossroads of ancient routes through the Dauphiné (Dôfenâ), Burgundy, Switzerland, and Italy, in a wide valley between the Bauges and the Chartreuse Mountains on the Leysse River. 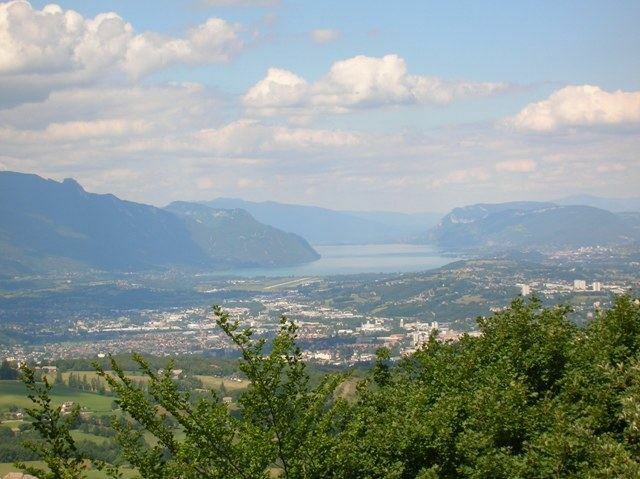 The metropolitan area has more than 125,000 residents, extending from the vineyard slopes of the Combe de Savoie almost to the shores of the Lac du Bourget, the largest natural lake in France. The city is a major railway hub, at the midpoint of the Franco-Italian Turin–Lyon high-speed railway. Chambéry is situated in southeast France, 523 kilometres (325 miles) from Paris, 326 kilometres (203 miles) from Marseille, 214 km (133 mi) from Turin, 100 kilometres (62 miles) from Lyon and 85 kilometres (53 miles) from Geneva. It is found in a large valley, surrounded by the Massif des Bauges to the east (dominated by Le Nivolet, upon which La Croix du Nivolet is found), Mont Granier (Chartreuse) and the Chaîne de Belledonne to the south, the Chaîne de l'Épine (the most southern mountain of the Jura) to the west and the Lac du Bourget to the north. The towns surrounding Chambéry are Barberaz, Bassens, Cognin, Jacob-Bellecombette, La Motte-Servolex, La Ravoire, Saint-Alban-Leysse and Sonnaz. 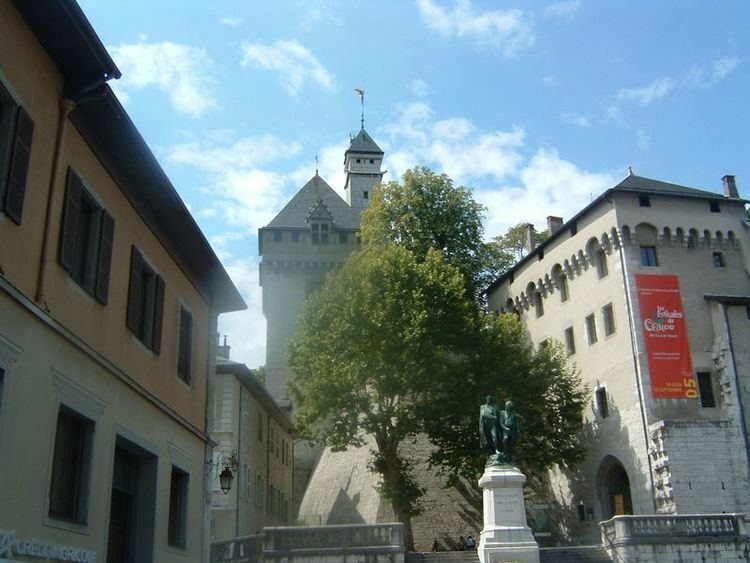 The history of Chambéry is closely linked to the House of Savoy and was the Savoyard capital from 1295 to 1563. During this time, Savoy encompassed a region that stretched from Bourg-en-Bresse in the west, across the Alps to Turin, north to Geneva, and south to Nice. To insulate Savoy from provocations by France, Duke Emmanuel Philibert moved his capital to Turin in 1563, and, consequently, Chambéry declined. France annexed the regions that formerly constituted the Duchy of Savoy west of the Alps in 1792; however, the former Duchy and Chambéry were returned to the rulers of the House of Savoy in Turin in 1815 following the defeat of Napoleon Bonaparte. The need for urban revitalization was met by the establishment of the Société Académique de Savoie in 1820, which was devoted to material and ethical progress, now housed in an apartment of the ducal Château. Chambéry and lands of the former Duchy, as well as The County of Nice, were ceded to France by Piedmont in 1860, under the reign of Napoleon III. The first counts of Savoy settled into an existing fortress in 1285 and expanded it in the early-14th century to serve as a residence, seat of power and administration, and as stronghold for the House of Savoy. However, it quickly became obsolete as a serious fortification genuinely capable of resisting a siege. Due to constant French hostilities on the château, Duke Emmanuel Philibert decided to move his capital to Turin. The château remained purely an administrative centre until Christine Marie of France, Duchess of Savoy, returned to hold court in 1640. It was the site of the 1684 marriage between Victor Amadeus II of Sardinia and Anne Marie d'Orléans, niece of Louis XIV. Victor Amadeus II, having abdicated, lived here with his second wife Anna Canalis di Cumiana before they were imprisoned at the Castle of Rivoli for trying to reclaim the throne. In 1786, Victor Amadeus III enlarged it, adding a Royal Wing. Under Napoleon Bonaparte, the Aile du Midi ("South Wing") was rebuilt and redecorated to house the imperial prefecture of the department of Mont-Blanc. Elaborate modification to the structure were made again after Savoy was annexed by France in 1860. Today, the political administration of the department of Savoie is located in the castle, and it is open for tours and concerts. 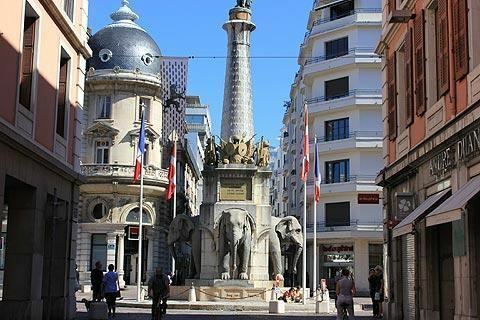 The Fontaine des Éléphants ("Elephants Fountain") is the most famous landmark in Chambéry. It was built in 1838 to honour Benoît de Boigne's feats when he was in India. The monumental fountain has strikingly realistic sculptures of the head and forelimbs of four lifesize elephants truncated into the base of a tall column in the shape of the savoyan (savoyarde) cross, topped by a statue of de Boigne. At first, the landmark was mocked by the local residents who were annoyed by it, but it now is accepted as one of the city's symbols. Since the early controversy, the statue kept its nickname of les quatre sans culs, ("the four without arses", which sounds in French similar to the title of the best-known movie by nouvelle vague director François Truffaut: Les quatre cents coups, "The 400 Blows"). A total restoration was done between Wednesday 17 December 2014 and 1 July 2015. The Cistercian Abbey of Hautecombe, founded in 1135, is one of the burial places of the rulers of the House of Savoy. 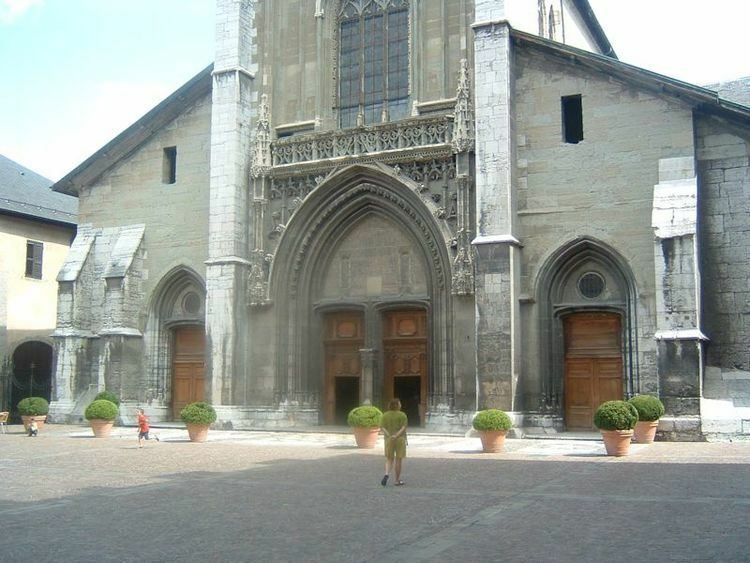 Saint Francis de Sales officiated at Notre-Dame de Myans (established before the 12th century). Francis I of France went to Notre-Dame de l'Aumône at Rumilly in the 13th century as a pilgrim. The Sisters of St Joseph, an order founded at Chambéry in 1812, devotes itself to teaching and charitable work, and today, its members are now widespread. Chambéry is also the administrative headquarters of the Orchestre des Pays de Savoie. Chambéry is home to a famous engineering graduate school, Arts et Métiers ParisTech (ENSAM), that settled an institute of research in 1994. This institute offers doctoral and master programs in the field of mechanical and industrial engineering. Chambéry is also home to the INSEEC Business School, a French business school which offers Master in Management – Grande école program educational system. Chambéry Airport serves Chambéry in the winter. The Chambéry-Challes-les-Eaux station provides rail connections, including a nonstop TGV service to Paris-Gare de Lyon. 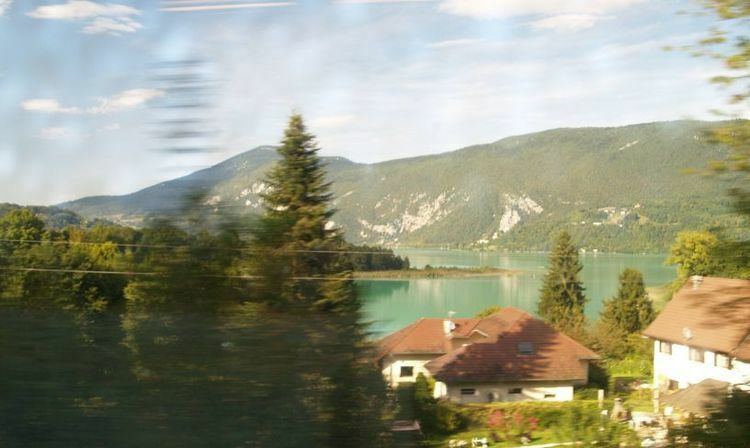 High-speed rail service also continues east along the Maurienne Valley and through the Fréjus Rail Tunnel to Turin, Italy. STAC is the local bus system. Chambéry is home to the 13th Battalion of the Chasseurs Alpins. Chambéry is home to SO Chambéry Foot and to Chambéry Savoie Handball. Chambèry is birthplace to French Footballer Emanuel Rivière. Gauvain de Candie, count of Derruyre, novelist and poet of the House of Candia, who in 1475 at age 28 he composed the famous "Chason d'Amoure" recited poems to the ducal couple of Marguerite of Austria and Philibert II, Duke of Savoy. Olivier Giroud (1986-), French international footballer and striker for English Premier League club Arsenal F.C. Grégory Lemarchal (1983-2007), French singer and winner from the reality TV program Star Academy in 2004. Grégory Lemarchal, the winner of the popular reality TV show Star Academy in 2004 and a French singer lived in Chambéry until he died due to Mucoviscidose.